Janet trained at Guildhall School of Music and Drama. During her early career she won several singing competitions, including two consecutive years in Paris for singing French song, and was the first mezzo soprano to be taken on by YCAT. She was the first singer ever to sing live on Day 2 of Classic FM and also gave the first female duet programmeon ‘Friday Night is Music Night’ for the BBC. Her voice can be heard in the opening sequence of the 1995 British comedy film, ‘Caught in the Act’. 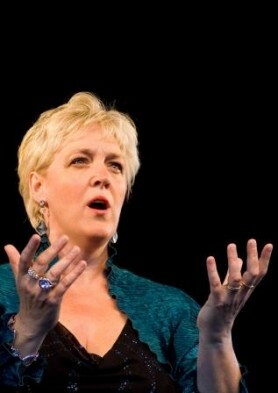 Janet made her operatic debut at ENO in John Buller's Bakxai (The Bacchae), sang at Covent Garden in Monteverdi's Orfeo and worked with Opera North, Welsh National Opera on tour, The Royal Opera at Covent Garden, English National Opera, Kent Opera, London Opera Players, and Opera Interludes. Janet now focuses on oratorio and the concert platform and her interpretations of Elgar have been particularly noted. Last year she added The Apostles to her repertoire. Concerts for the 2015-16 season include the Verdi Requiem; Britten’s Cantata Academica; Rachmaninov’s Vespers; Rutter’s Feel the Spirit and Elgar’s Sea Pictures. During her career Janet has formed an enduring recital partnership with pianist John Flinders. Together they were invited guests in Tokyo for the then Prime Minister John Major following a recital tour of South America. Unusual moments in her careerhave included singing for the Spice Girls at Geri Halliwell’s house following the christening of her daughter; being a backing singer on the Classical Brit Awards; singing a ‘hip hop’ track; singing the National Anthem on ice (carefully!) before an Ice Hockey match and in September 2009, and singing for the first Royal Wedding at the Chapel Royal, Hampton Court for 500 years when Lord Frederick Windsor married Sophie Winkleman. She has given invited vocal master classes at Stetson University, Florida, at the Music Conservatoire in Tokyo, and in May 2010 in New York for present and former students of Julliard School, and is the vocal tutor at Cranleigh Summer School. She teaches singing and has also established Talking Voice, delivering much needed CPD to teachers and voice professionals on spoken vocal and presentation skills. Janet's latest role is as a presenter of 'The Classical Collection' on Brooklands Radio which she broadcasts live on alternate Sundays. In each programme, Janet selects music to entertain and bring classical music to a wider audience. From time to time, Janet interviews a guest about their music making asking them to select some favourite pieces. You may have seen Janet on the BBC programme, ‘Britain’s Great War’ being interviewed by Jeremy Paxman. Her family was in the news in 2013 following the discovery, in a French farmer’s field, of the remains of her great uncle who was an Officer in WW1. The Burial in France was attended by Prince Michael of Kent and broadcast worldwide. In 2014 she appeared on ‘The People Remember’ also on the BBC. Janet Shell…resplendent in a beautiful red dress with glittering earrings, gave an impassioned performance, vividly compelling and totally in character. She fixed us all with a challenging smile and captivated us with her warm, dramatic voice.